Create the Perfect, Intimate Outdoor Space. We spend a lot of time outdoors, whether it’s entertaining or just relaxing. One of the most important factors, is creating an intimate and private area. We want to be able to unwind in our gardens without worrying about prying eyes. 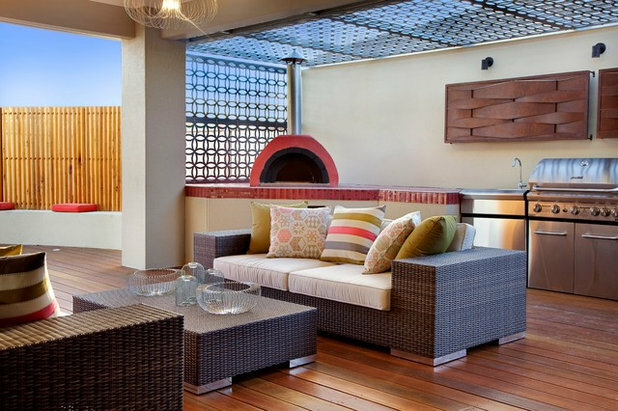 There are a range of options to ensure that you create a beautiful and private outdoor space, that you can relax in. Take into consideration the design of your property, the space available and use these top tips, to help you create your perfect garden. It is important to look at the space you have available carefully, to get the most out of it. Breaking up your layout, will allow you to utilise the space and create smaller intimate spaces throughout. Screens are the perfect solution for adding privacy to a large outdoor area. Use them to create smaller pockets of enclosed spaces, without closing it off entirely. 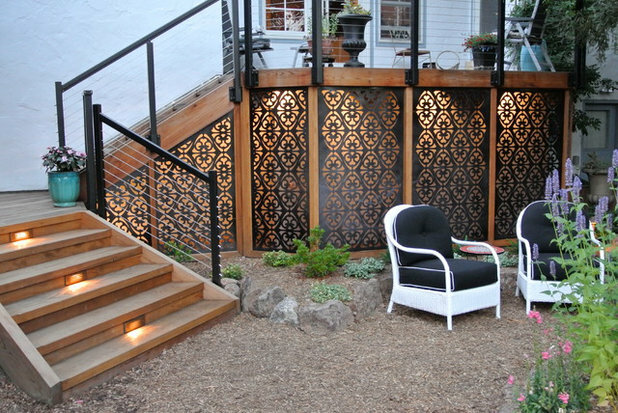 Mix up laser cut designed screens like ours, with hedges, timber, or even fabric. You also need to think about access throughout the garden, connecting your space. By connecting enclosed spaces you will create privacy, while still allowing flow throughout the area. Make sure you consider the design and style of your home. If this isn’t taken into consideration, when you go from indoor to outdoor, it won’t flow and your outdoor space will feel strange. Incorporate the interior style of your property into your exterior, ensuring that the interior and exterior compliment each other. Use a similar colour scheme and furniture that is similar to the era and design of your property. Custom screens allow you to personalise the design, so that you can create the pattern you want, ensuring that they fit with your scheme. If you have already decorated your interior and you are now looking to extend the design to the exterior, custom screens are the perfect way to connect the house with the garden. By incorporating a feature into the garden, you can add a sense of intimacy as well as a point of interest. A water feature will help make your space more intimate, less in terms of layout, but more by adding a soothing noise to block out your neighbours! Different points of interest will create small pockets of intimate spaces throughout your garden that you can connect together. Create a feature screen, with a bold and interesting design, to really add some wow factor too. Once you have planned your layout, designed your intimate areas and incorporated features and access to them; use a variety of plants and furniture to make your space the perfect place to relax. Vary the height and size of your plants and vary the shades of green you use; this will create more depth to the area. Include fabric decorations such as, pillows or a rug. This will add texture to the space and create comfort. Warm lighting will also help you create an intimate space; use hanging lights or string lights. Include feature screens that have rich colours, such as the ‘Red Emperor Pearl’ or ‘Weathered Copper’, to create more warmth and cosiness. Get in touch with us to find out how our range of screens, can help you create your perfect space outdoors. Whether you are looking to create privacy outdoors, or a multi-functioning living area indoors, custom screens are the perfect solution when thinking about space, privacy and design. When you are designing a new home, or updating your existing home, you want to make your dreams a reality and create the space you want. Custom pattern screens allow you to showcase your personality, in a functional manner; creating the perfect design solution. A lot of companies in the laser cut industry are hesitant to cater to a client’s request of customised designs. We very much believe that in a consumer driven market, it is important to be able to provide the customer with what they want. There are endless possibilities when it comes to pattern choice, if you can imagine it, we can cut it. For a recent commercial project we completed, we were asked to design, manufacture & install a bright striking entry portal to rab the attention of anyone approaching. Using a 3mm solid aluminium plate lasercut in one of our standard range patterns 035 and installed on rods with powder coated aluminium tube, we powder coated it in a standout X15 Orange which is sure to have the desired effect. Whether you are building a new house, or revamping an old one, you want to create your perfect home. By creating custom patterns, it really allows the owner to get exactly what they want, with a unique design. When considering an open-plan area, to successfully combine openness and separation, it is important to make sure that if you are dividing a room with a screen, that you consider the colour scheme, layout, functionality and visual properties. Your screen design should flow with the room, and depending on your design, make a statement. By incorporating custom patterned screens, you are able to create the space you want and have control over the design – allowing for a bespoke and fantastic design solution. Get in touch with us and we can work with you and our design team to create the perfect feature for your next project. Choosing Materials for Decorative Screening. Whether you are thinking about installing decorative screens yourself or getting someone else to install them, it is incredibly important that you use the correct materials. Your screen could look amazing, but if the right materials haven’t been used, it won’t look that way for long. Before you start on any screening project, ensure that you have read up on the best quality materials to use. This Small residential project incorporates one of our architectural designs “Pom Pom” using aluminium RHS we custom make all the framework in house and design the pattern to suit the clients particular size requirements. Powder coated in a bright white satin this tiny project has a not so small impact on the finished look of the property. There is a range of cheap and nasty materials used in the decorative screening industry, that can leave customers out of pocket or their maintenance schedule damaged; having to replace shabby materials. At Kleencut Solutions our ranges only use high quality 3mm solid aluminium plate with a Dulux powder coated finish. For custom projects we can of course use a whole range of other high quality material if requested from; timber, acrylic, Perspex, plastic, copper, brass and more. If you are considering a decorative screen make sure you are educated on the following materials. Corten steel is a mild steel that once left to the elements will develop a beautiful rusty patina and texture. Used in the right specific application it is great. However that lovely looking discolouration will leech rusty stains all over whatever is beneath it, creating a maintenance or cleaning nightmare for the unsuspecting customer. There are ways to combat such a thing by using marine clear coat sealers, although they tend to burn off in the sun over time, thus costing more money than anticipated. What we recommend to attain the same look for a similar price, is to use a solid aluminium plate and a wonderful product called “Interpon sable Core Ten powder coat”. It is a corten steel replica powder coating that is a great alternative. You still achieve that rusted look finish with a bit of texture, however you save on painful maintenance and expensive clear coatings. Aluminium composite is the most popular product being used as a budget option material for decorative screens, frequently seen used in the major home & hardware stores. This product is a 3 year time bomb waiting to happen. Developed in china using a .1mm D grade recycled aluminium skin on each side, it is made for cladding usage and meant to have a silicon expansion joint covering any cut edges. More and more companies are using this as a budget option for screens. What people don’t realise, is that it in 3-4 years all the ugly open edges, where you can see the composite, will deteriorate and the cheap dream will become their nightmare. We all love to save a buck here and there, but in some cases when you are looking to renovate or bring some life to your space, you are far better looking at the purchase as an investment. Spend a bit extra to have a high end top quality product, like powder coated solid aluminium plate laser cut screens. Recycled timber is another product currently on the market, that requires constant re-oiling maintenance or expensive painting to achieve the desired colour. This material requires regular upkeep; it doesn’t have the solid density of aluminium plate, therefore it chips and scratches easily and can swell around the fixings over time. It does of course have one great upside, being it’s recycled hardwood pulp and good for our planet, but that is quickly forgotten when you add the routing, painting, oiling and various other toxic elements to achieve the finished product. At Kleencut we can fully install your products or give you all the know how to DIY install yourself, making sure you choose the right products. It can be easier than you think and save you in the pocket at the same time. We want to open a topic of discussion, where you the client can ask any questions you may have that we can help with your project. This design was used throughout the development as per the clients request, the stair well is the highlight of this project with the dappled light flowing through the pattern onto the stairs. This type of screening provides protection from the elements as well as adding a design statement to the building itself. The screening covers the entire stair well and is a real design statement, everyone who passes by stops to check it out! If your property doesn’t give you the seclusion you need, our aluminium privacy screens are the perfect way to add a touch of solitude without compromising the appearance of your building. With a wide selection of beautiful and innovative designs available, our products add style add charm to any building whilst delivering the discretion you are looking for. Project: Raine & Horne on Racecourse Rd, Ascot, Brisbane. Kleencut Solutions was tasked to come up with a front design that complimented the building itself and the surrounding area. Our task was to incorporate a brand new steel awning on the front of the premises. We came up with a design which was inspired by the look of a high rise building with the lights on, giving it that signature realestate look. Living green walls are natural air-filters, creating a cleaner, more invigorating work environment that will lead to better overall employee health and production. Officer workers are often exposed to air toxins in their work environment such as formaldehyde, carbon monoxide, VOCs and benzene. Living green walls metabolize harmful toxins while releasing oxygen into the workplace air, much like office plants but on a much larger scale. The interior and exterior living green walls function to cool the air in the warmer summer months by a process known as “evapotranspiration.” The winter months see the added advantage of building insulation thus reducing energy costs for heating the building. Exterior living green walls can reduce wall surface temperatures by as much as20 degrees celcius, resulting in significant energy savings and air conditioning costs. One of the lesser known benefits of living green walls, the structures can reduce noise levels in buildings. Plants have been used, throughout the world, to reduce noise along roads and highways. Living green walls expand on this concept as vegetation ‘naturally’ blocks high frequency sounds while the supporting structure can help to diminish low frequency noise. Living green walls act as extra insulation with a layer of air between the plants and the wall. They also reduce noise levels by reflecting, refracting as well as absorbing acoustic energy. Our Green Screens are constructed from solid aluminium, twice folded for structural integrity with a 10+ year Dulux powder coat warranty. Available in 8 standard sizes, pot configurations and fully customisable to suit your space, our Green Screens are perfect addition to any residential or commercial application. We specialize in custom work, so if you want a screen made completely to your specifications visit our website, Request a Quote and describe your ideas to us! Kleencut Solutions Announce Launch of the ‘Green Screen’. We are excited to announce the launch of our newest product the decorative ‘Green Screen’. The screen incorporates the beautiful aesthetics of a vertical garden with our architectural decorative screening; the end product is the ‘Green Screen’. Partnering up with DMC Landscapes, we are able to provide customers with options such as plants, installation, irrigation and more. Create your perfect space to relax in peace with these beautiful screens, enhancing your home and complementing your design. We laser cut the unique pattern of your choice around the perimeter and place our recycled polypropylene wall pots into the mounting slots, we then fold the outside sheet twice and weld it to create a rock solid integrated frame with built in fixing points. We have 8 standard sizes and pot configurations to choose from and the beauty is, we can customise the system however you please, or join them together to cover the entire side of a building. With different plant and irrigation options available in the market you can create a unique vertical garden feature incorporating the style and sophistication of our decorative screening, to suit any application. Constructed from solid aluminium, twice folded for structural integrity with a 10+ year Dulux powder coat warranty our Green Screens use specially designed pots to lock into the screen grid in three places. Available in 8 standard sizes, pot configurations and fully customisable to suit your space, our Green Screens are perfect addition to any residential or commercial application. We also specialise in custom work, so if you want a screen made completely to your specifications visit our website, Request a Quote and describe your ideas to us! Houzz is a great website for all your property inspiration. Recently they posted about Laser-Cut Screens and we wanted to share it with you. For the complete article click here. 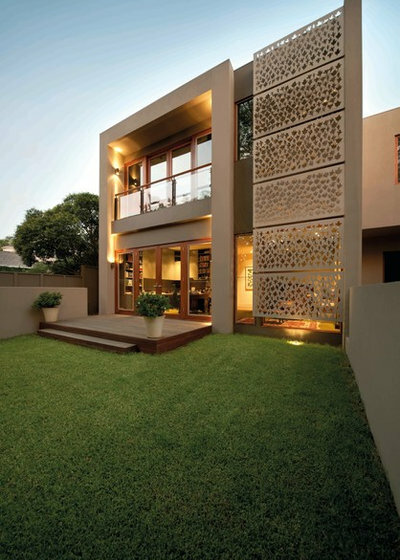 Aesthetically, laser-cut architectural screens can be used to provide a decorative wow-factor to the exterior of a home. But functionally, they can also provide privacy, shade, light, shelter and ventilation. 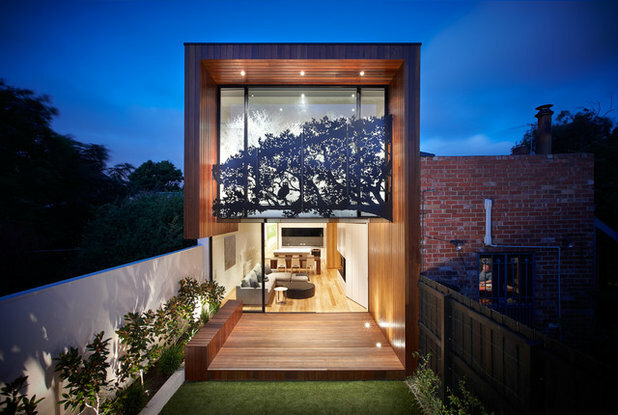 Screens have certainly come along way since the days of simple trellises, and now laser-cut screens are available in a range of materials with customised patterns to suit the style of most homes. 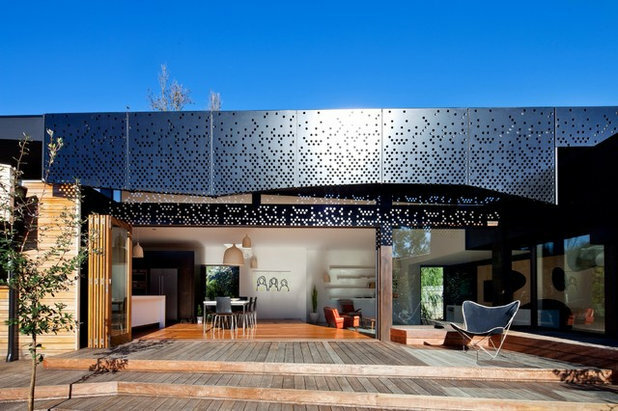 Here are 10 reasons to put up a laser-cut screen on your house. WHAT IS A LASER-CUT SCREEN? A laser-cut screen is sheet of metal or wood that has been precision cut with a laser to create a pattern. They can be made from stainless, weathering, mild or galvanised steel, powder-coated aluminium, MDF, reconstituted hardwood or marine plywood, among other materials. Patterns can range from geometric to abstract to botanical, and everything in between. 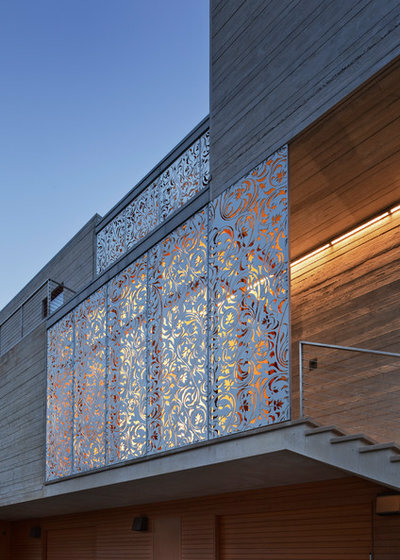 Architecturally, laser-cut screens can be applied to indoor or outdoor spaces, and can be used to blur the boundaries between the interior and exterior of a home. The ornamental element is visible from both sides of the screen, plus light shines through either way that you look at the screen – you could say, they cut both ways. WHY INCORPORATE A SCREEN AT HOME? 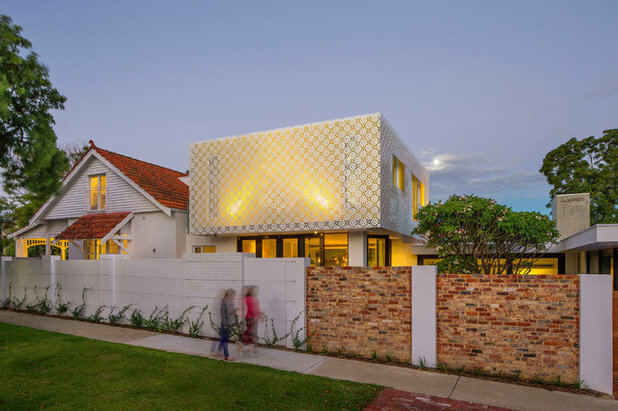 Combatting the issue of privacy in inner-city suburbs, this laser-cut screen blocks out neighbours’ views into the upstairs master bedroom. 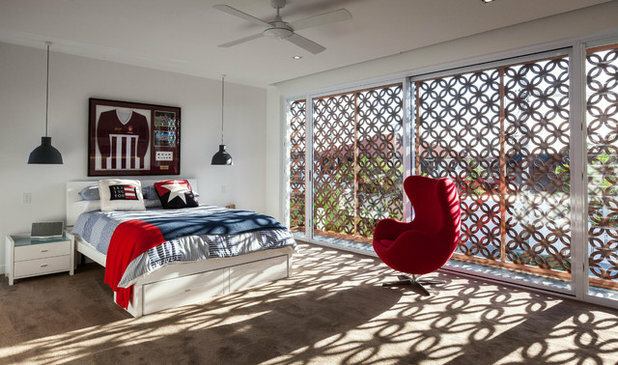 The tree motif is inspired by the shadow created by a tree removed from the site, and it screens 70 per cent of the view into and out of the bedroom. This allows unobstructed light to stream in from above. 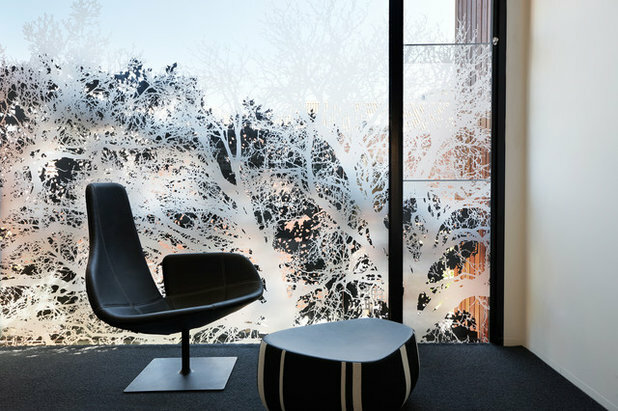 The reverse of the screen is painted white to be less visually obtrusive, while the tree motif blends beautifully with the views of the local environment. This renovated 1980s duplex has decorative screens veiling the windows at the front and rear of the house, providing both sun protection and privacy. 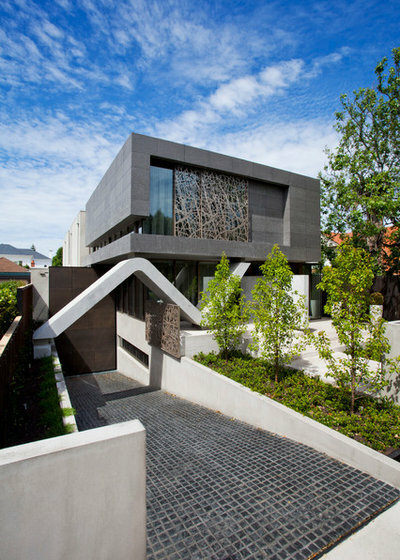 The geometric pattern used on the screen is complementary to the lines and volumes of the house. A laser-cut screen can function as an outdoor awning, serving to reduce the effects of sun and rain on the exterior of a home or balcony. The greater the depth of the screen, the more protection it will provide. Plus, check out the great shadow it makes on the wall behind. 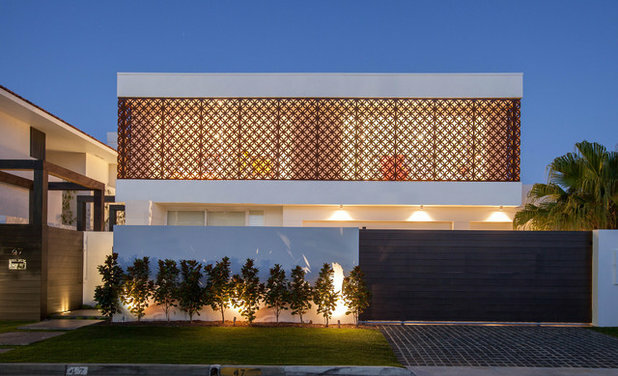 Around the upstairs level of this house, the laser-cut metal screen mediates between inside and outside and adds visual interest to both. Its pattern is inspired by the floral motif of the original carpet and fireplace tiles of this renovated Arts and Crafts home. “The screen provides visual richness, shade and protection to openings while offering opportunities for passive surveillance of the street,” the owners say. 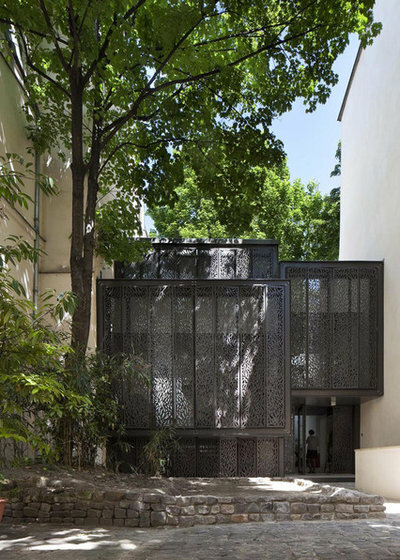 Filigreed laser-cut metal screens are used as shutters across the expansive windows of this French home. They create dappled sunlight inside as well as providing privacy from passers-by. A laser-cut screen forms the roof and wall of this outdoor kitchen, blurring the lines between the indoor and outdoor space. The screen also provides ventilation for cooking, and some shade and protection for those inside. 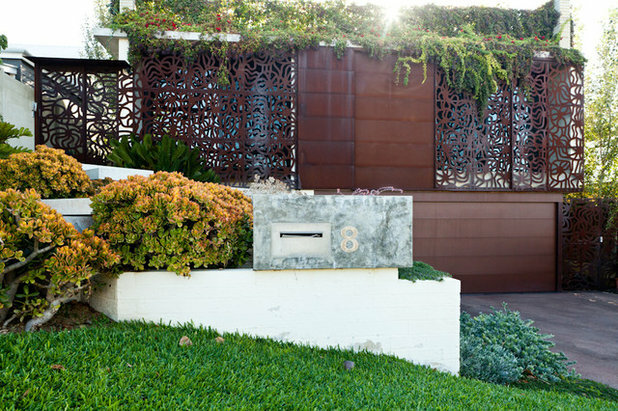 A copper screen with a free-flowing pattern beautifully complements the lush green landscaping that surrounds this home. The result is an organic and harmonious look that brings the house and its environment together as one. The space under the stairs or under the structure of a house is not always that appealing to see. A laser-cut screen is a decorative way to conceal the space, while still allowing it to be used for storage. Plus, this one is back-lit for a dazzling effect at night. … and from the inside? 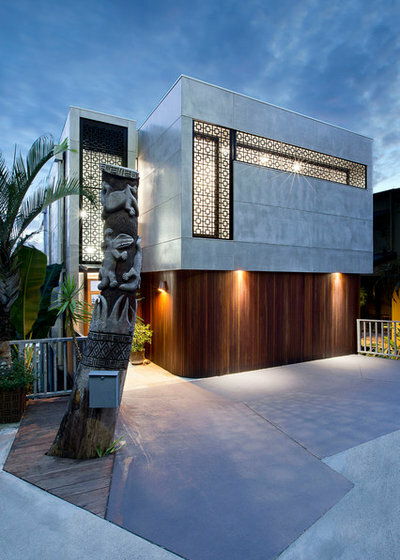 The screens that enclose the narrow balcony around the exterior of this house cast a decorative pattern across the floor. Shield your family and friends from bad weather when they’re coming in and out of your home by incorporating a laser-cut screen around the outside. The swirling, sinuous pattern on this screen is carried throughout the home, to allow residents to feel like they are alone despite having close neighbours on both sides. Most home burglaries are opportunistic, meaning if your home appears to be safe and secure, you are less likely to be burgled. There are a number of ways to ensure that you protect your home and minimise the risk of being broken into. Here we discuss our top tips to make your property safer. Installing fences and gates around your property is an instant deterrent for any burglar. It makes your property harder to get into and ensures that your belongings are not on show. Seeing as most home burglaries are by opportunists, fences will instantly discourage burglars. With our range of fencing and gate options, you don’t have to compromise on design – we can create custom work for your specific project. With our new range of ‘Ezi-Ali’ gates and fencing, you can also install them yourselves, contact us for more information. Lighting is a brilliant way to add security to your home. Simply having lights on in a home, will put off burglars, by making them believe someone is in the house. Obviously you don’t want lights on all the time, it would be quite costly and not to mention not very energy efficient; however there is a range of technology that allows you to set your lighting to turn on at specific times, through a timer. With home technology you can even turn your lights on, from afar, with your smart phone. Motion sensor lighting is also a great way to put off unwanted visitors. The easiest way to deter burglars, is to simply make it look like someone is there. Keep up appearances by leaving a pair of shoes outside the home. If you are going on holiday, why not leave your car in the driveway and catch a ride to the airport. Ask your neighbours to pop round and open/close your curtains, or even take your trash can out on garbage day – making your home look lived in. Probably the most obvious solution, install an alarm system. Even just making it look like you have an alarm system will make your property look more secure and deter burglars. Don’t however put the brand of alarm system on your windows, it will make it easier for burglars to know what alarm system you use and disable the alarm. Choose an alarm system that uses motion sensors as well as protecting doors and windows, for added security. Protecting your home is easier than you think. Visit our website or contact us, to find out how we can protect your home with fencing and gate solutions. New Ezi-Ali Range Launched by Kleencut Solutions. Over at Kleencut Solutions we are incredibly excited to announce the launch of our new range Ezi-Ali. The ‘Ezi-Ali’ range of aluminium slats and louvre products work together with our already popular, architecturally designed screens. The range includes; louvre shutters, gates, slat fencing, window screens and aluminium shutters. The products have been designed with the customer in mind, allowing home owners to install them with ease. They also compliment our already popular designed screens, so that you can use them in conjunction with our screens and create a design that flows throughout your property. There are an array of benefits to installing shutters in your home. They are a low maintenance option, they add privacy and create a perceived security, and create UV protection and flexible light control. Shutters are a highly desired addition to any home, meaning they will be a good investment to your property. The Ezi-Ali louvre shutters have been designed for a quick and easy assembly, that you can do yourself. We have a variety of louvre frames both standard and custom designed, to ensure the perfect finish for your home. With an array of planking systems and two piece blades you can achieve a three dimensional look and our machining division manufactures various fittings, to suit specific projects. The benefits of fencing are quite self explanatory, but mainly, they allow you increased privacy and security. The aluminium slat fencing in our ‘Ezi-Ali’ range is designed to be easy to assemble – see a theme here? We use pre-machined frames at various spacings, which incorporate our Pushloc system; eliminating the requirement for any fixings. It allows for a high quality finish unlike other systems, as there are no snap-in fill pieces or gaps. The range has an array of frames to meet all applications, as well as 10 different aluminium slat blades and two piece slats available in 3 different sizes. The comprehensive range of angles and channels, along with our new 1 and 2 way post systems, will create a professional finish every time. Our ‘Ezi-Ali’ range of Aluminium shutter systems includes three different types of shutter systems. This system has been designed to achieve a minimalistic look and to mirror the framing designs of the traditional timber shutters. The beauty of this is it maximises vision without effecting the structural integrity of the shutter. This system has been designed using a more robust frame and blade system to meet the higher density high rise market. Saying that we have found an array of customers that use this system purely for its chunkier look. The All Weather Security Shutter.